It was one of the last nice days of summer, and I decided to try to ride from Wilkes-Barre to Rt. 92 in Exeter to see the remains of the railroads and the trestle up there. OK, now for the good stuff. 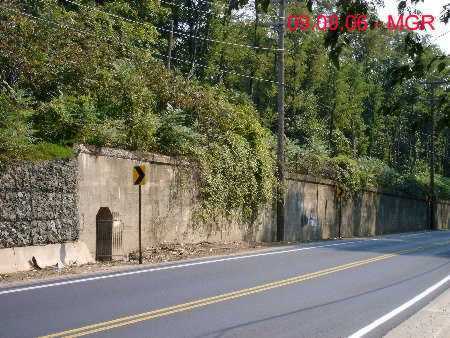 If I recall correctly the retaining wall was to get railroad tracks up to the level of the Coxton Bridge. Further up the road, out of frame to the left of the picture, the road curved. At the curve, a trestle crossed Rt 92. to reach Forest Castle Junction. The tracks went down the street to go in back of the old PNER headquarters. Railpace had an artice on this, but I can not find the issue. Everything was grown in since I visited here in the late 80's. I could not find a trail up to the trestle. I guess my trip with the Underground Miners taught me what to do. Bike thru the tunnel, of course. 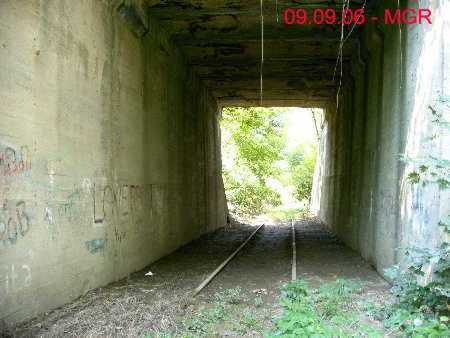 Once under the ramp, found a tral that led to this section of trackage. This was the old West Pittstion and Exeter. In the old days, it ran to Stanton Station, a coal fired power plant. During the Pocono Northeast's reign, the tracks went as far as the Celotex Plant. 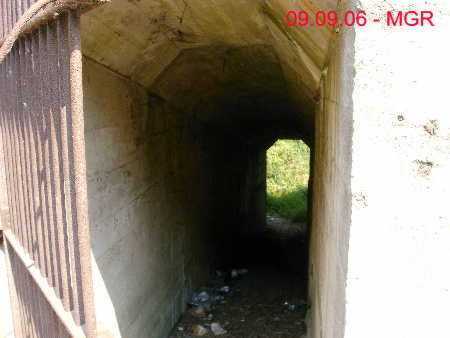 Once on the other side of this culvert, I found a trail up to the trestle. 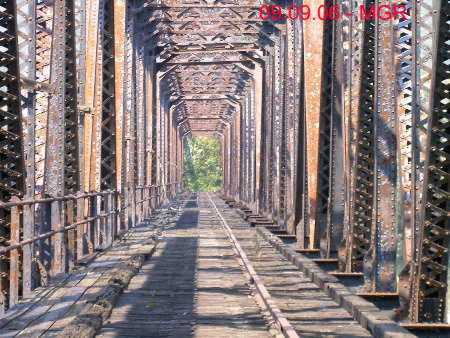 A view of the trestle. Notice the structural damage to the pier. The trees have grown in since the late 80's. You are now actually on top of the concrete culvert. Telephoto view of the bridge. 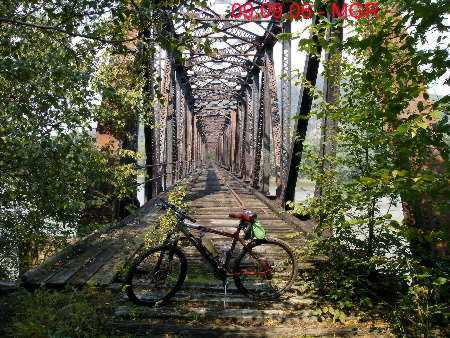 Don't go climbing on old Railroad bridges. This one was abandoned in 1982ish by the Pocono Northeast. 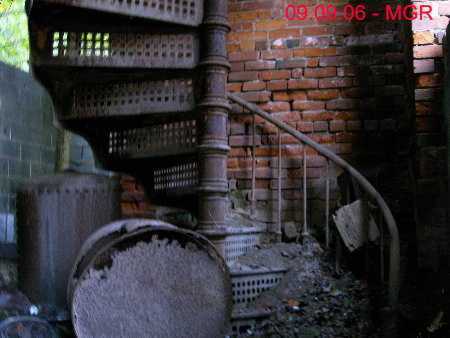 In 2006 it was abandoned for about 24 years. 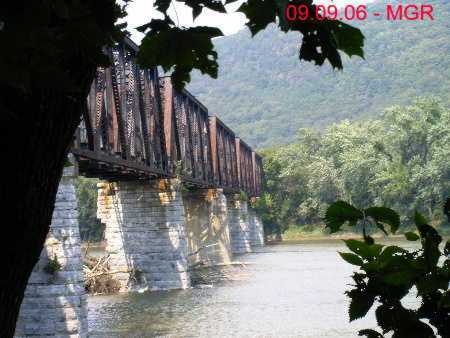 It was orignally owned by the Lehgih Valley Railroad and CONRAIL. You got to figure that the LV did not do anything with it since the late 60's if at all. 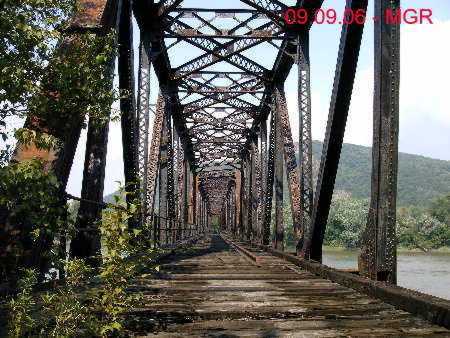 The ties and beams on the end of the bridge looked VERY rotten. 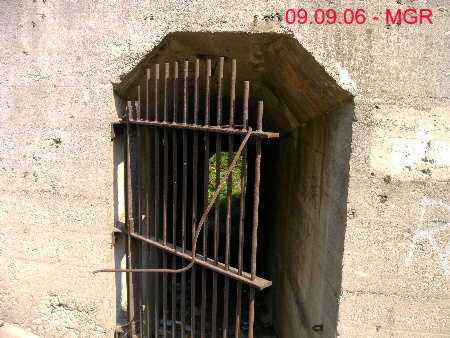 A good chance that if you walked out on it you would end up going thru them into the river. Another view of the bridge. No trains running on it today. 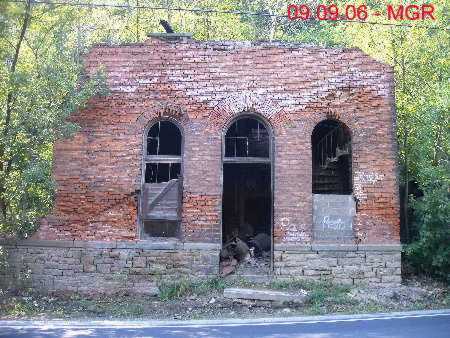 This building is right after the curve in the road were the trestle crossed Rt. 92. It was a dangerous bridge with a center pier in the middle of the road on the curve. There were many accidents here. The building was said to be a brewery. 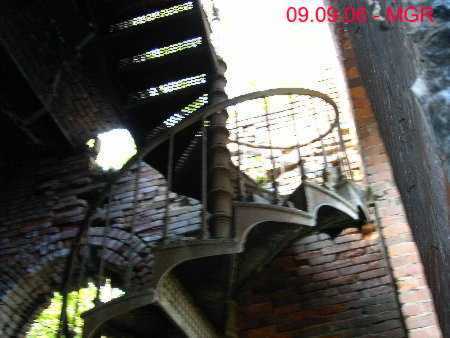 There is a neat spiral stairway in it. The building was crumbling, so I stuck my camera in the doorway and took a few shots. 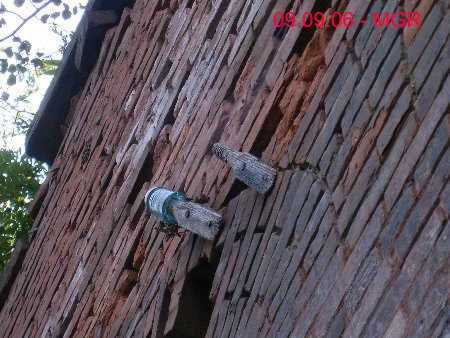 Some insulators on the brick wall. On the way back near the Jewish Cemetary, there was this crossing. Top right of photo shows tracks going upriver to Harding. 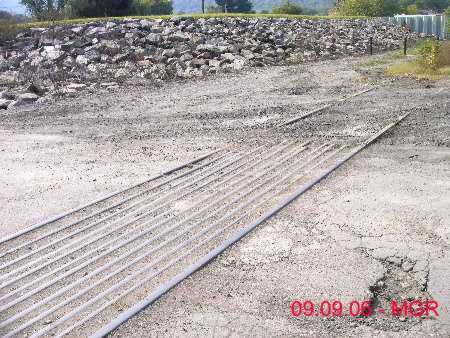 Left bottom, the tracks would go past the Sullivan Trail Breaker. Now all I had to do was ride back to Wilkes-Barre. I did 30 miles that day. On the return it rained on me a little, but beat the storm out. Too bad the Sullivan Trail Breaker was not still there.